(SitNews) Juneau, Alaska - Governor Michael Dunleavy wrote on FaceBook today, "While I hope the legislature will pass a responsible budget, I will use every constitutional authority given to me to secure Alaska’s future." Earlier this year, the governor unveiled his proposed FY 2020 budget with $1.6 billion cuts in spending. 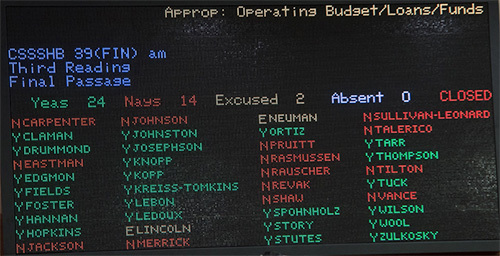 And later today, the Alaska House of Representatives voted 24-to-14 to pass an operating budget bill, House Bill 39 which will minimally reduce state spending by as little as $200 million of the $1.6 billion deficit. The bill - or the buck - has been passed to the Alaska Senate where more difficult decisions will have to be addressed. “We recognize that we have a deficit and must make substantial cuts to keep downward pressure on spending,” House Speaker Bryce Edgmon (I-Dillingham) said. “At the same time, this budget demonstrates our commitment to fund core services and reject measures that would solve our fiscal problems on the backs of Alaska’s most vulnerable.” Edgmon recently changed his party affiliation from Democrat to Independent. Quoting a news release today from the Alaska House Majority Coalition, "The budget expresses the House Majority’s commitment to streamline government while also protecting schools, public safety, and other critical services that underpin our economy." Quoting today's news release from the Alaska House Majority Coalition, the $4.3 billion of unrestricted general fund spending was approved for Fiscal Year 2020, meaning there is a $200 million reduction compared to what will be spent in this fiscal year. Governor Dunleavy has consistently stressed that Alaska no longer has the revenue to support the budgets Alaska has had in the past and has proposed significant budget cuts in order that Alaska lives within its revenue means. One of the Governor's key messages during his presentations in Ketchikan this week, was to empower Alaskans in this process by allowing Alaskans to vote on a series of constitutional amendments. "Before lawmakers take portions of the PFD, we think you should have a say," Governor Dunleavy posted on FaceBook. The Governor has also stressed no new taxes without a vote of the people in the series of constitutional amendments proposed. SJR 6, is the Governor's proposed constitutional amendment that will cap government spending and create a savings plan for Alaska. Governor Dunleavy asserts that it is time for Alaska to stop spending money that we don’t have. Over the last few weeks, the Governor has held statewide discussions outlining his proposed budget and permanent fiscal plan for Alaska. On Monday, April 8th, Gov. Dunleavy was in Ketchikan for a public presentation hosted by the Ketchikan Chamber of Commerce. The Chamber announced well in advance of the Governor's presentation that the luncheon would be open to the public. In 2015 when the price of a barrel of oil hit $26, the government started using its savings. In the past four years, the government has taken $14 billion out of the constitutional budget reserve to met the gap between the state's expenditures and the state's revenues. Putting into perspective, that $14 billion could have provided electricity for all Alaskans for eternity at a low rate, pension obligations could have been paid off, the bond debt could have been paid down, but the legislators decided to do more with the money. Today, Alaska has a structural deficit, meaning the state's revenues and the price of oil and the revenues that come from production is not enough to meet the state's expenditures. Taking money from the constitutional budget reserve and adding to the budget when the state has no revenues to support the budget approved, has resulted in only $2 billion left this year down from a high of about $16 billion. There is about $177 million in the statutory budget reserve - both the constitutional budget reserve and the statutory budget reserve will be gone in approximately 14 months if the state does not arrest the increase in spending. The Governor says if the state can arrest the increase in spending through the Constitutional Amendments he is advocating for the appropriation of savings and spending rule, and the government keeps spending about 2% to 2.5% percent a year, there is a chance the state can get out of deficit spending because the estimate is that in the next five years Alaska will be getting about 200,000 to 300,000 barrels of new oil on the North Slope. The difference between what former Governor Walker tried and what Governor Dunleavy is proposing, former Governor Walker tried to cover the spending gap by filling the budget deficit with new revenues - the permanent fund and the Permanent Fund Dividend. The difference between the permanent fund and the PFD is the earnings reserve of the permanent fund is available for the legislature to spend. For decades a portion of the permanent fund has been used to fund the Permanent Fund Dividend and the other portion was just put back into the fund. Starting over the last few years, part of the earnings and part of the PFD was used to cover the budget deficit. To increase revenue, nine different taxes failed the legislature that were proposed former Governor Walker failed. Governor Dunleavy is proposing that the state gets its expenditures more in line with the state's revenues through reducing the budget dramatically. "That approach is causing a great discussion in the state of Alaska." What do we want to pay for, when do we want to pay for it is part of the discussion. The Governor is proposing a spending and savings rule at about 2% to 2.5% a year. If the state had had this in place since 2006, the wealth that would have been represented by what the state had not spent would be approximately $29 billion dollars in wealth. This could have been put into the permanent fund, could have had free electricity of all Alaskans, could have had a railroad to Canada, or other choices. Currently, Alaska has $64 billion dollars in the permanent fund and the constitutional budget reserve is down to about $2 billion. If the state had put the $29 billion that was spent into the permanent fund, instead of $64 billion in the fund, Alaska would have a larger fund at about $127 billion. This would have allowed the legislature to take out of the fund $6,400 per person and about 6.2 billion taken out to pay for government. Meaning, if money had been saved in budgeting, Alaska would have had the money to pay for its budgets today and into the future. In the Governor's presentation in Ketchikan, he said at the rate Alaska is spending, and if nothing changes, what will happen over time is that the earnings of the reserve will be spent down in the Permanent Fund. The Governor said for those who have said over the last two years that all you have to do is take the Permanent Fund Dividend and everything [revenue] will be fine, under SB26 the bill passed last year that allows the government to take $3 billion out of the area's reserve, that $3 billion is designated to be spent between the government services and the people's Permanent Fund Dividend. Governor Dunleavy said at the rate of spending by the government, the Permanent Fund Dividend will be gone in four years. Not only will the government's amount from the $3 billion of SB26 be consumed, the government will also have to consume the people's Permanent Fund Dividend from that amount. Governor Dunleavy said the enemy of Alaska is just like the enemy of the past in terms of savings, is our increase in spending. What happens over time is you start to draw from the earnings reserve even more and the earnings reserve starts to disappear, then the government will have to tax people. The governor said when people tell him to just take the Permanent Fund Dividend, he tells them this is not a solution when the state is spending the reserve at 4% to 4.5% a year. In just a few short years, the state runs out of the reserve under SB26. His response when people just say 'tax me', to fill the $1.6 billion dollar gap in the budget, for every man, woman and child from the second they are born to the second they die, the tax would be approximately $2,200 per person. For every working person, if you estimate about 300,000 people working, the tax would be $5,300 per person, for a working couple that would be almost $11,000 state tax annually just to fill the budget overrun of $1.6 billion. To service the rate of spending by the government, taxes would continue to increase to service this rate of spending more than the state takes in in revenue. Alaska's economy is last in the nation and Alaska has the highest unemployment. Alaska has been in a recession longest in the state's history. Under the budget reductions proposed by the Governor, the earnings reserve would actually grow the savings. The Governor also discussed the Alaska Marine Highway System, education, Medicaid and more. For those unable to attend, the full presentation on the budget by the Governor and comments and questions by those attending has been made publicly available for viewing by KPU TV. "The past few years, politicians have gotten between you and your PFD, taxing thousands of dollars to pay for government. My proposed constitutional amendment, SJR 5, would guarantee that no changes happen to your PFD without a vote of the people," wrote the Governor on FaceBook. $72.9 million was cut from the Department of Health and Social Services, primarily to Medicaid. $49 million was cut from the School Bond Debt Reimbursement Program, meaning that local governments will need to contribute more to build and repair schools, but the program itself will be preserved and funded at a sustainable level. $14.5 million was cut from the Department of Transportation, with the largest single line-item reduction being a $10 million cut to the Alaska Marine Highway System. This encourages efficiencies but rejects the governor’s plan to end ferry service on October 1. $13 million was cut from the Department of Corrections, with an effort to limit the ability of DOC to send prisoners out-of-state and to encourage in-state services like electronic monitoring and halfway houses. $10 million was cut from the University of Alaska, encouraging the Board of Regents to find efficiencies but rejecting the governor’s plan to cut $134 million from UA, which would threaten doubling of tuition or closure of entire campuses. According to the Alaska House Majority, the budget passed today protects K-12 education, with the base student allocation and per pupil transportation fully funded and forward funding for Fiscal Year 2021. Head Start, Early Childhood Education grants, and Best Beginnings are also fully funded, as is critical public broadcasting infrastructure. Quoting a news release from the House Republicans, "The House Majority has taken the historical action of not allowing amendments currently sitting on members’ desks to be heard. Among the amendments the House Majority refused to consider was an amendment providing for a Permanent Fund Dividend. A dangerous precedence has been set that will affect every future legislature in Alaska." House Republicans said the budget was forced through by a vote of 24-14, along caucus lines. From here, H.B. 39 heads to the Alaska Senate for consideration. If changes are made in that body, a joint House-Senate conference committee will convene to sort out the differences before final passage from the Legislature. The governor then has 30 days to sign the bill or to make vetoes. Articles & photographs that appear in SitNews are considered protected by copyright and may not be reprinted without written permission from and payment of any required fees to the proper freelance writers and subscription services.